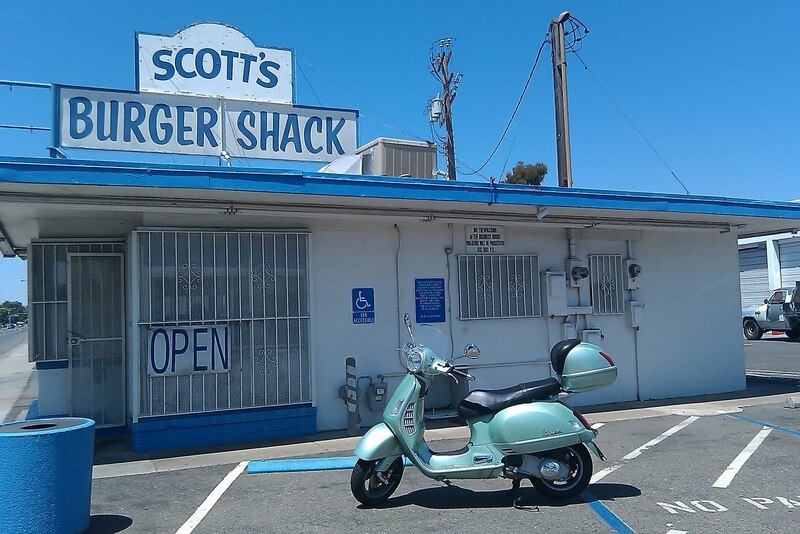 Scootin’ up Franklin Boulevard you cannot miss Scott’s Burger Shack (4127 Franklin Blvd.). A small, spray-painted white building situated almost on the street on the East side of the busy thoroughfare. There is no inside seating at Scott’s and only three sticky-blue benches on one side of the appropriately named “shack.” The lack of seats is complemented by the four parking spots (if you do not include the handicap space). All the windows are covered in white spray-painted bars. Behind the bars the windows are completely covered giving the visitor no visibility into the kitchen. Even the order window is usually shut when you approach it. If any of Scott’s personnel hear you when you reach the counter the black plastic door opens with an unanticipated slap! A less-than-excited woman forces a semi-smile and sharply asks what you would like to order. On some occasions, you have to tap on the sliding door. This siege mentality probably has to do with the environment—Franklin Boulevard looks like a rough neighborhood. There are quite a few rundown shops and old buildings that appear to be vacant and the pedestrians are on the rough side, too. When I pulled up on my Vespa a couple sitting on one of the blue benches wanted to know what kind of motorcycle I have. “It’s a scooter,” I politely corrected the one who asked.” When he asked how much it is worth I got a little nervous, but I figured he would not be able to lift my scooter and keep his precious shopping cart of rusted coaxial cables and old wire, so I considered myself safe. Besides these deterrents, the neighborhood is stable enough to support some new stores and El Novillero, one of the best Mexican restaurants in Sacramento. Now comes the positive side of this post. 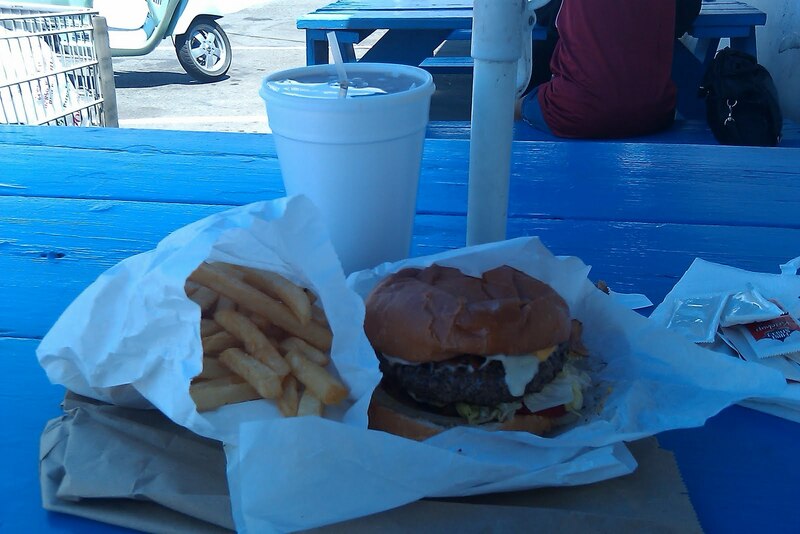 Scott’s Burger Shack makes one of the best hamburgers in town—well worth the trip to the area. I ordered a Fatboy Combo that comes with fries that are too thick to be regular, crispy fries and too thin to be steak fries, but who cares! I trip on these details when the burger is pedestrian. The Fatboy with cheese is an excellent burger: a handmade, ½ lb of fresh hamburger (Scott’s purveyors deliver daily) with lettuce tomato, pickles, and a slice of (raw) onion. There is nothing unique or genius about the Fatboy. It is just a big burger with fresh ingredients—a far cry from most hamburger offerings in town. I sat on one of the sticky benches listening to the din of loud rancheras music from the Mexican restaurant across the boulevard and a street woman singing my praises for buying her a bag of fries, “God bless you, sir. God bless you. You are so kind…” I heard all this, but I was not listening—with every bite I took of my Fatboy it seemed that my eyes would roll in the back of my head. Besides great hamburgers, Scott’s Burger Shack makes dogs, chicken sandwiches, subs, tacos, and other items like deep fried zucchini, mushrooms, and chili-based side orders: more reasons for me to scoot back here soon. I had an iced tea when I was there, which was typically bland for most hamburger places that sell mostly soda; however, Scott’s is also known for their shakes—another reason for a return visit, which I hope will be soon. If you go to Scott’s plan to get your food to go, as stated above, it is not a friendly or comfortable place to stay and eat. You can even order ahead since they take telephone orders: 916.451.4415. Let me know if you try something besides their Fatboy—I tend to stick with things I like so a comment on their chicken sandwiches, subs, or dogs might break my rather dogmatic tendency towards the familiar. Next ›IL Inferno Scorciante Due and a Hot Burger too!